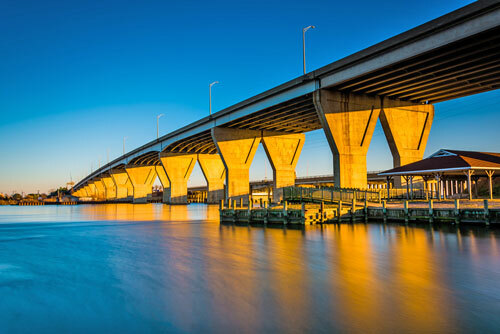 Kent Island Area Attractions - Things to do in the Kent Island and Stevensville area. The island features an abundance of marinas and restaurants that attract visitors from nearby Annapolis, Baltimore, and Washington DC. Separated from the mainland by Kent Narrows, Kent Island once served as a trading post for the first permanent English settlement in Maryland. The island later developed into a major seafood packing and processing area. Stevensville is the largest town on Kent Island and is home to several historic structures, including the restored Stevensville Train Depot and Christ Church, home to Maryland’s oldest congregation which was founded in 1631. Visitor information is available from the county visitor’s center at 117 East Main Street. The area has lots of seafood restaurants and marinas. It also has lots of outlet stores, with the Queenstown Premium Outlets nearby. The Chesapeake Exploration Center is located on the Kent Narrows waterfront. The Exploration Center houses the Queen Anne’s County Office of Tourism and features interpretive displays about the Chesapeake Bay. It’s also a good place to pick up pamphlets and brochures for area attractions. Matapeake Beach is located on Kent Island’s western shore. 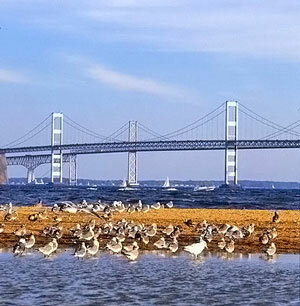 This small parks offers nice views of the Chesapeake Bay Bridge, a public swimming beach, a cafe, an outdoor amphitheater, woodland trails, picnic area, and a dog beach. The Matapeake Pier and Boat Ramp and the Romancoke Pier and Kayak Ramp provide access for boating, paddling, and fishing. Matapeake pier is 650′ long, lighted, and open 24 hours a day. The surrounding three-acre park has restrooms and a picnic area with grills. There’s also a 25′ wide boat ramp at Matapeake. The Romancoke Pier is also open 24 hours a day and has a kayak launching facility. See details about facilities and directions to the piers. For those who enjoy lighthouses, the Bloody Point Bar Lighthouse can be seen from the southern point of Kent Island. Terrapin Beach Nature Park is located just north of the Bay Bridge on Kent Island. The park includes a one mile nature trail, pond, two observation blinds, and a boardwalk to the Chesapeake Bay. The park is located off MD 18, inside the Chesapeake Bay Business Park. The Wildfowl Trust of North America operates the Chesapeake Bay Environmental Center (formerly known at the Horsehead Wetlands Center) just eat of Kent Island. The 500 acre sanctuary features paths around six waterfowl ponds and through different types of wetland habitats. Kayak rentals are available May 1st – November 1st for a fee. The Cross Island Trail spans Kent Island from Terrapin Nature Park to Kent Narrows. The trail is about six miles long. There are several places along the way where you can park and enter the trail including Terrapin Nature Park, Old Love Point Park, Castle Marina Road, Kent Narrows Boat Launching Ramp, and the Chesapeake Bay Exploration Center. The Kent Island Farmer’s Market is a producer-only market that is held each Thursday, 3:30 – 6:30 year-round. Located a Christ Church, 830 Romancocke Road (Route 8), about one and half miles from Route 50.